Baguio City, Philippines - The highlight of the month-long flower festival, the Panagbenga in the summer capital of the country happens today, February 23, 2014 as the city kicked off the Grand Float Parade. Livestream feed of the biggest event of North Luzon this week is made possible through the partnership of Sun.Star Baguio and Smart Communications Inc (Smart). 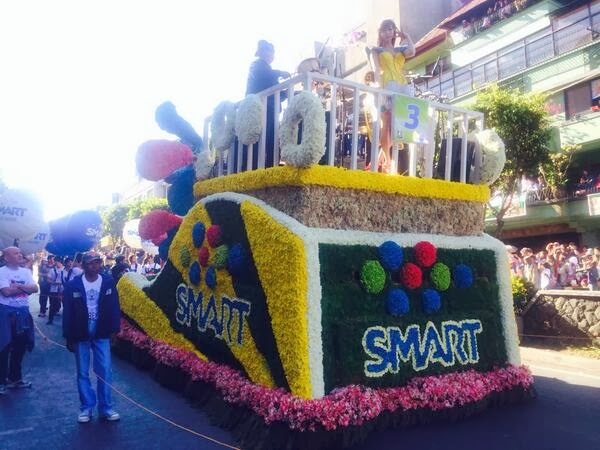 Powered by Smart LTE, the latest high-speed mobile internet connectivity, Panagbenga 2014 can be seen by thousands of Filipinos in the country and around the world. The 2014 celebration of Panagbenga marks the 19th year of the annual flower festival celebrated every February in Baguio City. The festival started in 1996 to showcase and reflect the history, traditions and values of Baguio and the Cordilleras. The term 'Pangabenga' is of Malayo-Polynesian origin, meaning "season of blooming". Joining the float parade today are the following: Gold Dust Creations, Megapines Realty and Development, GMA Networks Inc., Taloy Norte Farmers, Department of Agriculture-Cordillera Administrative Region, International Pharmaceuticals Inc., Philippine Seven Corporation, Taodharma Inc. (AllPhones), Jollibee, Psalmstre, PIDC-TPLEX, MNTC–NLEX, Baguio Ecopark Inc., Beauche International, Smart Communications, International Praise Center, AMA Magsaysay Baguio City, MLhuiller, Le Monet Hotel, City Government of Baguio, Baguio Country Club, and SM City Baguio. Note: You may switch to Camera 2 to check updates live at the Session Road, Baguio City.